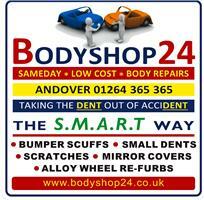 Bodyshop24 - Garage/Vehicle Services based in Andover, Hampshire. FREE ESTIMATES ON DEMAND JUST TURN UP AT ANYTIME MONDAY TO FRIDAY 7.30 AM TO 5.00 PM OR SATURDAY MORNINGS 9.00 AM TO 1.00 PM. Established in 1997 by Paul and Paula Russell this family run business has worked hard to gain an enviable reputation within the car paint re-finish and bodywork industry, for the quality of their work and in particular, for their dedication to providing the very best customer care and service. From its early humble beginnings, Bodyshop24 has grown steadily over the years, investing in and embracing new techniques and equipment. Which has along with their team of highly skilled technicians and their recently opened Bodyshop24 S.M.A.R.T repair facility, has enabled them to now offer a first class and competitively priced one stop solution for all your vehicle body work requirements. Working alongside all the major insurance companies, fleet owners and our ever growing customer base of satisfied clients. Bodyshop24 can offer an all-encompassing accident management solution to your individual needs. Our reputation for producing paintwork of outstanding quality and detail has led us to be entrusted with the paintwork requirements of many high profile customers. Standing for Small and Medium Area Repair Techniques (S.M.A.R.T), this exciting new addition to the services we can offer, is in our opinion a necessary and increasingly important alternative method of repair that any forward thinking body shop should be investing in. The concept is to save you, the customer, as much as 60% on body work repair costs, with the emphasis on same day or while you wait repair time. Whatever your requirements are, we promise to provide you with the best in customer care and service, together with a promise that you will only ever be asked to pay for our service when you are 100% happy with the quality of finish you can see.